Mobile Deposits: Tell Your Checks to Say Cheese! Deposit your checks into our high-yield liquid savings account! Learn more. Mobile Deposits (sometimes called Remote Deposit Capture) allows you to take a picture of your check using your mobile device and submit it to us for deposit. This free service is available immediately upon enrollment in our online/mobile banking service; all you need to do is download our mobile banking app. While our Mobile Deposits service is safe and secure, it’s important to always keep track of your deposited checks. If you take a picture of your check in your car, for instance, do not leave the check in your glove box, where your account information can be stolen. You also want to ensure you don’t re-deposit a check, as you’ll most likely be hit with a returned check fee, or, in more serious cases, suspended from using the service. 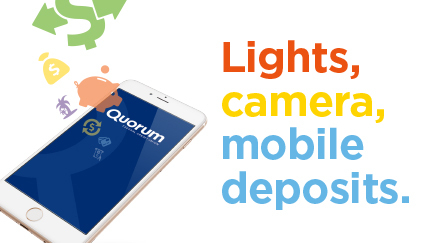 Below is everything you need to know about Quorum’s Mobile Deposits service. Download the Quorum mobile banking app for iOS or Android. Select Deposit from the main menu, then Deposit a check. Select the account to deposit funds into and enter the amount of your check. Take a picture of the front and back of your endorsed check. Click Deposit Check to submit for processing. Once a deposit is received, it is pending approval. If approved, funds are posted to the account according to Credit Union processing times but no later than 48-hours after submission. (Check deposits are not posted on Saturdays, Sundays, or Quorum holidays.) 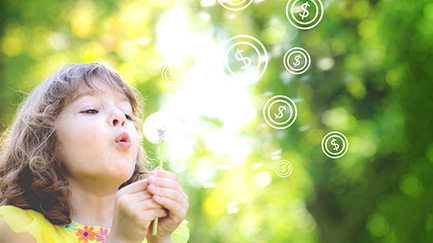 Funds will be available based on our regular funds availability policy, please refer to our Truth in Savings Disclosure for additional information. Remember: No one other than yourself should make deposits to your account and never provide anyone your online/mobile banking login credentials for any reason. The check must not be folded, bent or otherwise damaged. Remove all perforated areas from the check. Endorse each check with “FOR QUORUMFCU MOBILE DEPOSIT ONLY” and be sure that all payable parties sign. Place the check on a dark, flat and non-reflective surface. Avoid areas with bright lights or sunlight that might cause glare. Ensure the entire check (all four corners) is visible in the check capture area. Checks over dollar amounts designated by the Credit Union. Save your deposited paper check(s) in a secure location until you have confirmed it has been successfully credited to your account. Thereafter, store your checks securely for a period of 60 days, as we may ask for a copy of any check for verification. After that time, you may destroy the check. Log in to mobile banking, click on Deposits from the menu and then on the History Tab to be able to view your history. Deposits listed with a status of Pending are under review. If your check was rejected, you will receive a secure message in online banking indicating the reason. You will be sent a secure message in online banking if your deposit is rejected. To read our Mobile Deposits terms and conditions, visit https://www.quorumfcu.org/online-mobile-banking-service-agreement-and-disclosure, and go to the Mobile Deposits section. All Aboard the Mobile Banking Train!